Democrats retained Congress and the White House after the 1916 elections. 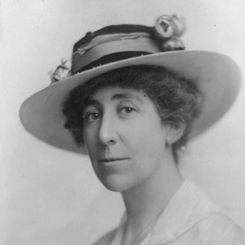 The 65th Congress (1917–1919) began historically: Montana’s Jeannette Rankin became the first woman to serve in Congress; President Woodrow Wilson delivered his war message; and Congress declared war on Germany. Congress then focused on World War I: generating revenues; instituting conscription; mobilizing industry; and protecting the country against espionage and sabotage. President Wilson’s “Fourteen Points” provided national goals for the war. Congress also sent to the states a constitutional amendment banning the production and sale of alcohol. 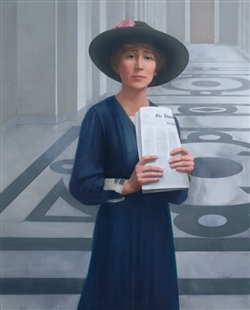 Jeannette Rankin of Montana, the first woman elected to Congress, was sworn into the House. The House adopted a war resolution against Imperial Germany—formally committing the United States to intervention in the First World War. 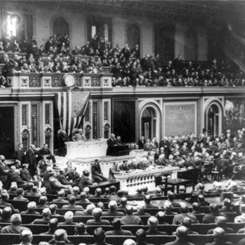 President Woodrow Wilson delivered an address outlining his vision for a program for world peace to a Joint Sessions and Meetings of Congress in 1918. 2Appointed due to Clark's resignation to join the military.